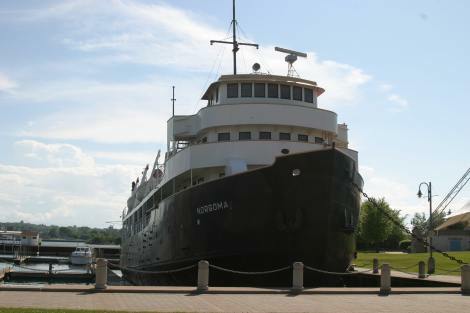 There was a lengthy discussion among City Council members Monday in regards to the fate of the Museum Ship Norgoma. Council's agenda for its regular meeting called for a vote to be held on whether to discontinue financial support for the troubled tourist site. It was strongly recommended in reports provided to Council by the Commissioner of Community Services and the Sault Ste. Marie Economic Development Corporation that further funding not be provided to the Norgoma. Council rejected a call from Councillor Brian Watkins for postponement of discussion. However, Council eventually voted for an official deferral of the funding matter discussion for two weeks. Watkins called for postponement of discussion, calling the Norgoma "an integral reminder" of our area's history on the community's waterfront. Watkins suggested the Norgoma would attract a greater number of visitors--and revenue--in view of this year’s Tall Ships visit to Sault Ste. Marie. For that reason, Watkins called for Council not to pull the plug on the vessel, at least in the short term. Councillor Susan Myers stated that tourism is on the rebound. "This is not the year to pull the plug," Myers said. Councillor Paul Christian stated as "painful" a decision it would be to end support for the Norgoma, that it was time to move on. Discontinuation of City support for the museum ship would transfer the fate of the vessel from the group which operates the Norgoma (the St. Mary’s River Marine Heritage Centre, or SMRMHC) to the City. Councillor Frank Manzo cautioned Council that if the City decided not to continue its financial support, the cost of maintaining the vessel would be enormous and the ship would have to be sold off. The Norgoma has been a visible, historic, yet financially challenged tourist attraction on the Sault Ste. Marie riverfront for decades. The City had a five-year agreement in place with the St. Mary’s River Marine Heritage Centre (SMRMHC), beginning in 2007, upon the recommendation from Destiny Sault Ste. Marie, whereby the Norgoma would receive $15,000 in City funding annually for five years, with the understanding the Norgoma would not be subsidized by the City beyond 2012. Reports from Community Services and the Sault Ste. Marie Economic Development Corporation’s CEO Tom Dodds pointed out that while some of the seven requirements laid out in the 2007 agreement had been carried out by the SMRMHC Board, others had not been met, such as submitting annual reports to Council and City staff as recommended in the 2007 report. Dodds stated in a letter to the Mayor and Council dated March 20, 2013, that despite having made some physical improvements to the Norgoma, the SMRMHC Board has failed to develop a long-term strategic plan for the site and has produced only minimal tourism benefits. There were 1,305 visitors in 2012, leading to a mere $6,600 revenue in 2012. Community Services pointed out that even a total of 8,000 visitors to the site in 2002 translated into no more than $9,000 in revenue. SMRMHC Board members had presented Council with a request for continued funding for the Norgoma in January 2013. The Norgoma, in its day, served as a passenger ferry along the north shore of Lake Huron, connecting various communities in the area with Sault Ste. Marie.